1. Going undefeated only matters to the '72 Dolphins. While Don Shula pops champagne and Peyton Manning loses sleep, Jim Caldwell, 1st year head coach of the Indianapolis Colts keeps moving. By pulling his starters in a close game on Sunday, Caldwell allowed the Jets season to continue and in turn started the great debate of the 2009 season. Does going undefeated matter? The quick answer is no, flat out. The New England Patriots were on the cusp of doing the impossible before handing Eli Manning and the New York Giants a Super Bowl ring, ask them which they would have rather had? The Colts 2009 goals probably went something like this: beat the New England Patriots (check), win the AFC South (check), earn home field advantage throughout (check), and win a Super Bowl (not yet). Any hurdle which was in their way, they would have had to conquer to achieve their goals, Peyton Manning getting injured in the 4th quarter of a meaningless game would substantially have changed the odds in achieving their final goal, a Super Bowl victory. That being said, with all their goals accomplished but one , Jim Caldwell made the conscious decision to protect that final goal as best he could and give his team the best chance at obtaining it. Game, Set, Match. 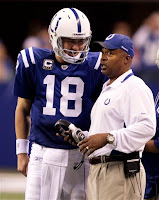 It'll take a day or two for Peyton to understand that if he hasn't already, but the Colts will be just as healthy as they are tomorrow as they were this morning, Jim Caldwell not caring about an undefeated crown is the best thing for them. 2. Quietly, the Patriots are taking shape. At 10-5 after three consecutive wins, the New England Patriots have clinched the AFC East and will open up the postseason in Foxborough. A somewhat tumultuous season for the darlings of the Northeast, the Patriots have tuned things around after their very average 7-5 start are looking very sharp. Albeit against Jacksonville and Buffalo, Randy Moss has caught 9 balls for 115 yards and four very important scores, it's safe to say the Panthers defensive backs and the media woke up a sleeping giant. In their last three games the Patriot offense has outscored opponents 72-27, not only is it a testament to their veteran laden offense, but the Patriots young defense seems to have improved a great deal. Just as quiet as the Patriots victories have been, the return of running backs Sammy Morris and Fred Taylor spell trouble for the postseason. An offense that makes you play the run and takes attention off of both Wes Welker and Randy Moss is a big problem for AFC defenses. While the Patriots have looked very beatable this season, in Miami and New York specifically, ask both Norv Turner in San Diego and Jim Caldwell in Indianapolis, neither of these teams want to play the Patriots in the postseason, even if New England does have to come to their places. 3. Colts & Saints move aside, there is a new #1. While they were undefeated, you really couldn't argue against them as the NFL's best. However, after the Saints recorded loss #2 and Indianapolis decided to rest their starters, it's tough to say any team is playing better than the San Diego Chargers. A 2-3 start turned into a 12-3 record after ripping off ten straight wins including their latest 42-17 ripping of the Titans this week. The ten win stretch included big against division rivals Oakland, Denver, and Kansas City, to go along with wins over playoff bound Dallas, Philadelphia, and Cincinnati. This may be the season of Phil Rivers, where the Charger quarterback has thrown for over 4,000 yards and recorded 27 touchdown passes. The Chargers have two of Rivers' top targets among the NFL's top ten receivers, breakout wideout Vincent Jackson (1,167 yards, 9 TD's) and Pro Bowl tight end Antonio Gates (1,145 yards, 7 TD's). More surprising is the play of veteran running back LaDanian Tomlinson who is once again back in the top of the pack in rushing touchdowns (12). Heading into the postseason, few teams are playing with as much toughness as San Diego and are putting fear in opposing defenses like they should. Not many teams can spot the opposing 20 points while they average 29 per game. Be weary of the Chargers, they don't need home field throughout to make this interesting. 4. 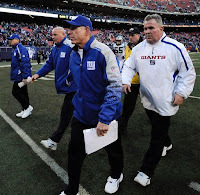 The real New York Giants sure stood up. Few teams can say they've experienced the full roller coaster of the NFL season . . . actually, many can say that but none more than the New York Giants. Upon opening the season to a 5-0 start, the Giants quickly dove into the tank dropping their next four games and 3-7 in their next ten. With their embarrassing 41-9 loss at the hands of a 7-8 Panther team, the Giants both closed out their final game in the Meadowlands and also ended their season. Not even Eli Manning's best statistical season of his career could keep the Giants above water. The biggest share of the blame can be linked to the Giant defense. A season ago, the Giants were the NFL's 5th ranked defense allowing just 18.4 points per game. In 2009 that number jumped to 25.5 and saw opposing offenses allow more than ten more rushing yards per game. An offense that saw some spark from young receivers Hakim Nicks and Mario Manningham could still probably use the rare abilities of the imprisoned Plaxico Burress. With a key injuries to the middle of their defense, Antonio Pierce, the young and impressive Kenny Phillips, along with the loss of former defensive coordinator Steve Spagnuelo to the Rams, the Giants will need to undergo changes next season. The 5-0 start of the Giants seems a long ways away at this point, especially after that once tough defense gave up over 200 rushing yards to Panthers running back Jonathan Stewart and made backup quarterback Matt Moore look like a pro bowler. 5. Let the 'Beast' out; final game decides NFC East crown. A December meltdown avoided and an Eagles team which won six straight to get to this point, the Cowboys and Philadelphia will square off for the NFC East crown and a home playoff game. Both teams have looked very sharp in the two weeks prior and show no signs of stopping. The Cowboy defense shut down the Redskins in Washington this week, a week after dropping New Orleans from the ranks of the unbeaten in their own place. Philly has scored 27+ points in each of their last five games and haven't lost since November 15th. Cowboy quarterback Tony Romo is playing lights out this month. In their last six games, Romo has thrown 9 touchdowns and just one interception which came on a tipped ball. Favorite target Miles Austin is both among the league leaders in receiving yards and touchdowns. The Cowboy defense is even more impressive allowing 20+ points only twice since October 25th. Led by a smashing defensive line which includes both Jay Ratliff and the surprising Anthony Spencer who is playing flat out nasty. On the other hand, nothing can be taken away from a Philadelphia team that is proving how ageless Donovan McNabb has become. A fresh stock of young backs and receivers in the stable, McNabb seems to continue his winning ways. In five of their last seven games, McNabb has completed 20+ passes and has played best when it counts most this season. Between McNabb and breakout receiver DeSean Jackson, the Cowboys will have their handful as these two NFC 'Beasts' square off on Sunday.